In 2014, Epigram Books will publish my debut novel, A Certain Exposure. But only if I manage to finish my revisions, so off to work with you now, Jolene. 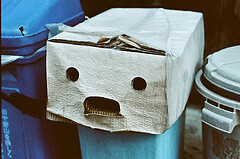 Image shows a carton with holes causing it to resemble a shocked face, shared under a Creative Commons licence, with thanks to yy yeung. This entry was posted in Blog and tagged A Certain Exposure, Publishing.